With summer gatherings on the horizon, we’re sharing an easy dish that lets your guests decide what they want to eat. Turkey meatballs, sides of pasta and rice, a few sauces and your guests can mix and match their way to foodie heaven. We’ll start with the meatballs, but if you are making sauces from scratch, you will want to make those first and then cook the meatballs. Combine the first 4 ingredients in your food processor and pulse until the oatmeal has the consistency of course corn meal and the herbs are finely chopped. Place the turkey in a large bowl, add the dry ingredients and then the beaten egg. Combine with a fork, but do not over work the meat. You want it tender, not dense. Add enough olive oil to lightly coat the bottom of your large skillet. Heat over medium heat until the skillet and oil are hot. Use a small scoop to make your meatballs. This will give you nice, even meatballs and they will be small enough to cook evenly. Place some meatballs in your hot skillet. Do not pack the meatballs into the skillet, give them a little room. Brown on 3 or 4 sides. Remove the browned meatballs from the pan and add another set. Don’t worry that they aren’t cooked through, we’ll take care of that once they are all browned. Return all of your meatballs to your hot skillet. Add 1 cup of red wine and 4 cups of beef stock. Bring to a boil, turn down and simmer for 20 minutes or until the meatballs are cooked through. Serve over noodles or rice with whatever sauces your guests enjoy. This makes 4 to 6 servings. Here are a couple of ideas for sauces. You can also use the Teriyaki sauce we made here. If you are rushed for time, pick up some of your favorite sauces at the grocery store and doctor them to suit your taste. Your guests don’t need to know you didn’t slave over them for hours. Remove the leaves from the herbs and chop finely. Combine all the ingredients in a sauce pot, bring to a boil, turn down to low and let simmer at least half an hour. To serve, place some noodles in a small skillet, add a few meatballs and a little sauce. Gently stir or toss to combine over medium low heat. Add a little sauce over the top after you plate the meatballs and noodles. This sauce goes together very quickly. 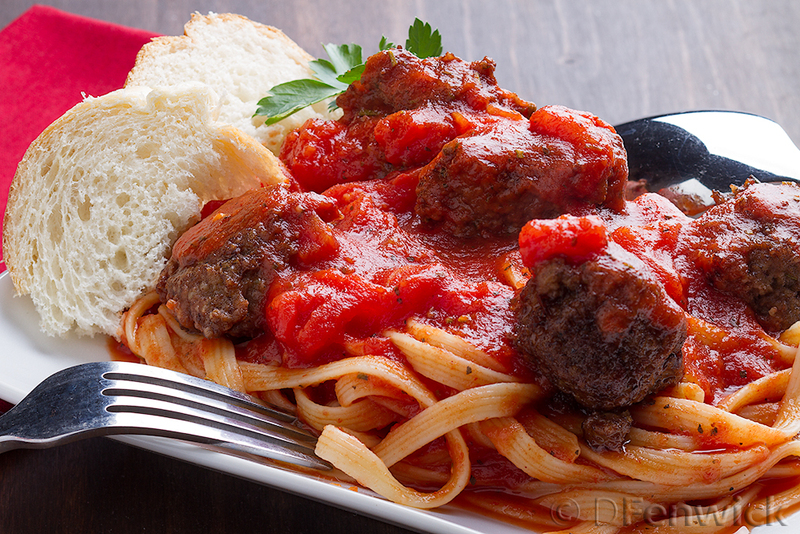 Make it just before you are ready to serve the meatballs. Take 1 1/2 cups of the liquid from your simmering meatballs and place it in a sauce pan over medium heat. Add the tofu based sour cream (or if you want, real sour cream). Stir to combine. Take a little of this liquid and place it in a bowl. Add a teaspoon of corn starch and mix well. Return this mixture to your pan. Stir while it comes to a boil. If you want it thicker, repeat with another teaspoon of corn starch. 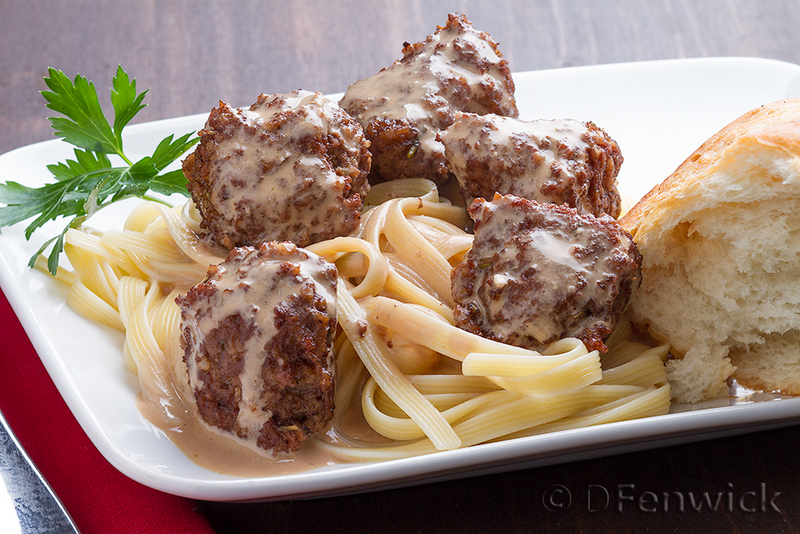 To serve, place the meatballs on a bed of noodles or rice and spoon some sauce over the top. Feel free to add onion, garlic or whatever other spices and herbs you and your guests enjoy. Sports and hot wings are almost a cultural obsession. Our house doesn’t really warm up to either – don’t hate us! 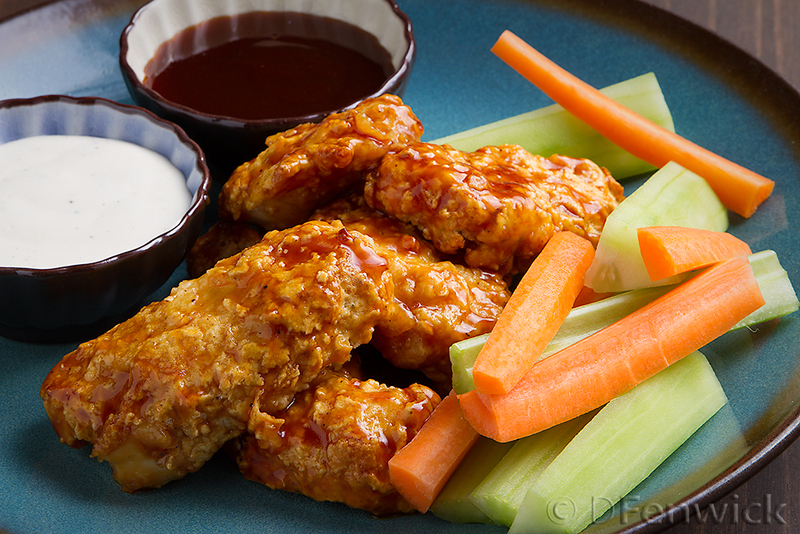 But dipping chicken (and veggie) into a condiment of choice DOES appeal to our foodie nature. So, if you want chicken for game day but want something a bit healthier than wings – here you go. Chicken breast strips breaded and baked. Preheat your oven to 425 degree F. Line a large baking sheet with aluminum foil and place a good sized cooling rack om the baking sheet. Put 1/2 cup corn starch into a large zip lock bag. Place 3/4 cup corn starch, flour, grated pecorino cheese and salt and pepper into another large zip lock bag and shake to mix well. Beat all 5 eggs in a wide shallow bowl. Wash chicken and pat dry with a paper towel. Cut the chicken breasts into 1/2 inch thick pieces, something close to the size of chicken wings. Place a few pieces of chicken in the bag of corn starch. Shake to coat evenly. Remove from the corn starch and shake off the excess. Place the chicken in the egg and coat evenly. Place the chicken in the second bag with the flour mixture and shake to cover well. Remove the chicken from the flour and dip in the egg again. Place on the rack on your baking sheet. Repeat until all the chicken is coated. I love spaghetti. I’ve probably been eating it for *almost* half a century. So when my cravings started down the familiar pasta pathway, I decided to make it a little differently. After a quick trip to the grocery store I returned triumphant with beef to slice and cook in my sauce. It was hearty, and a delicious change! Slice the beef into approximately 1/8 inch thick and a couple of inches long. Brown in a hot good sized, deep skillet with a little olive oil. Add all of the remaining ingredients, bring to a boil and reduce the heat and simmer on low for 30 minutes or so, until the beef is tender. 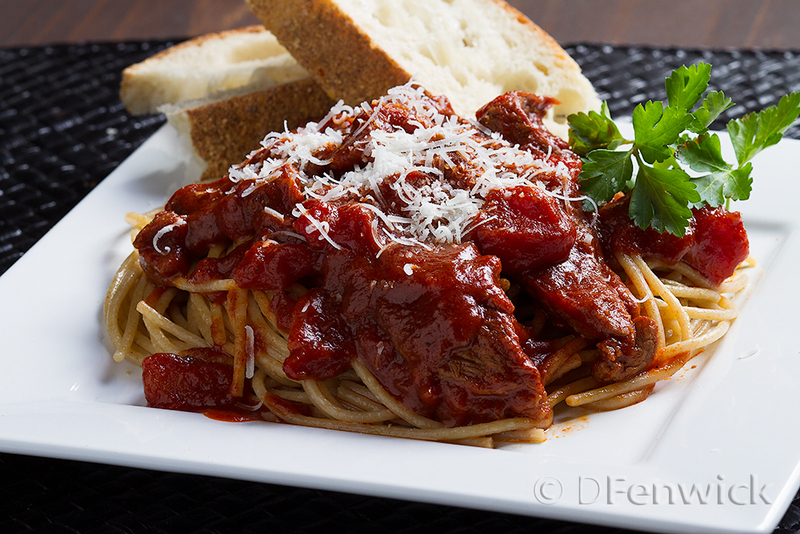 Serve over spaghetti noodles and top with some grated Parmesan or Pecorino Cheese. Add a slice of nice rustic bread and you have a great winter dinner. 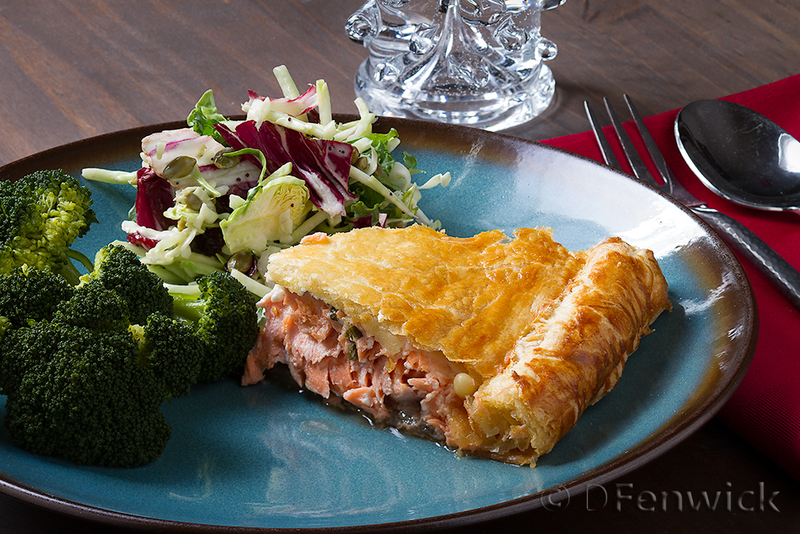 Tonight we are baking salmon in puff pastry. Because of food sensitives we *try* to avoid onion and garlic most evenings. 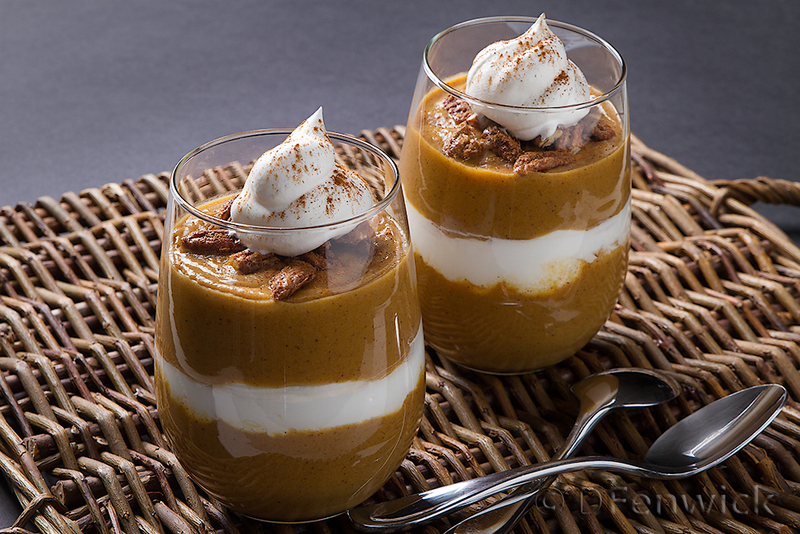 Although this recipe is ideal for both, I did not use them – but go for it if your tummy can tolerate them. Let’s get cooking. On a clean cutting board or serving dish place a layer of paper towels. Gently rinse your salmon, check for any bones then place on the paper towels and pat the fish dry. Set aside. In a small saucepan melt the butter then add the salt, chopped parsley, and cut lemongrass. When the butter begins to sizzle add the wine and tarragon, bring to a simmer then add the pine nuts. Let this percolate for about five minutes then remove from heat and set aside to cool. Next, prep your baking pan. I used a large baking pan with non-stick cookie mat laid in it. The mat was then lightly floured. Set aside. On a floured rolling board place one of your puff pastry sheets and roll out to a size longer and wider than your filet. The sides will all need to be rolled to seal in the fish so make sure you have rolled the pastry enough to accomplish this later. When you’ve finished rolling one sheet place this in your baking pan. Now center your filet in the middle of the pastry sheet skin side down. With a slotted spoon carefully scoop out the marinated parsley and nuts from the cooled butter mixture and scatter on top of the fish. If your fish looks a little dry, drizzle some of the butter mixture on it. No harm done, this will help the fish steam inside the pastry. Next sprinkle your goat cheese on the fish, then the grated pecorino. Next, roll out the 2nd pastry sheet to fit the size of the 1st one and cover the fish. Carefully tuck the top pastry sheet around the fish, you’ll want a tight seal here. Now take your egg wash and paint around the edges of the pastry. You’ll be rolling the edge over twice and hopefully to the edge of the fish, so paint enough wash to roll this much. If you have more pastry than needed, cut some off BEFORE you start to roll. Once the edges are rolled up and close to the fish take a fork and press down the rolled edges for a tighter seal. We’ll be baking this for about 40 minutes. The pastry should turn a golden brown. I inserted a thermometer into the salmon and it was approximately 165F which was perfect for us.